Major Leaguers recognize the on-field and off-field achievements of their peers through the Players Trust’s Players Choice Awards program. The Players Choice Awards are annual Major League Baseball awards, given by the Major League Baseball Players Association (MLBPA). The Players Choice Awards are given following a secret ballot by players. Four awards go to a player in each league, while two awards each go to one player in all of Major League Baseball. Prize money is donated to a charity of each winner's choice. The first Players Choice Awards were given in 1992, to the Comeback Player in each of the two major leagues. There were no other awards that year. In 1993, the Comeback Player awards were replaced by an Outstanding Player award for each league. Then, in 1994, two more categories were added: Outstanding Pitcher (in each league) and Outstanding Rookie (in each league). In 1997, the dual Comeback Player awards were again named, along with the first-ever single award — the Man of the Year — for one player in all of Major League Baseball. In 1998, a second non-dual award was added, Player of the Year. In addition, the Man of the Year award was renamed in honor of Marvin Miller, former executive director of the Major League Baseball Players Association. In 1999, a special Player of the Decade award was given. In 2015, a third non-dual award was created. The "Always Game" award is given to the player who – game in and game out – constantly exhibits positive energy, grit, tenacity, hustle, perseverance, relentlessness and sportsmanship; all for the benefit of his teammates and fans. 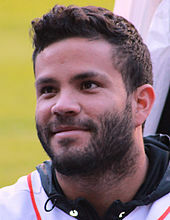 José Altuve was Player of the Year in 2016 and 2017. J. D. Martinez is the most recent Player of the Year. This award was first given in 1998. This award is given to "the player in either league whose on-field performance and contributions to his community inspire others to higher levels of achievement." First given in 1997 (as the "Man of the Year" Award), it was renamed in 1998 in honor of Marvin Miller, former executive director of the Major League Baseball Players Association. 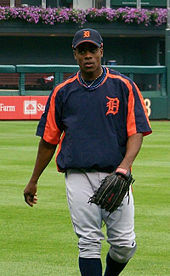 Curtis Granderson has won the Man of the Year Award three times. This award was first given in 2015. The award was not included in the list of 2018 winners. 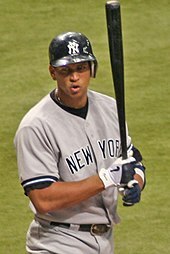 Alex Rodriguez was AL Outstanding Player six times. Clayton Kershaw has been NL Outstanding Pitcher three times. 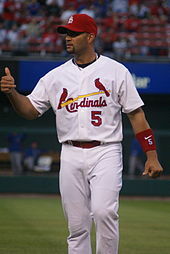 In 2001, Albert Pujols was the Outstanding Rookie in the National League. In 1992, this was the first ever Players Choice Award. There were no other awards that year. The Comeback Player award was not given from 1993 to 1996, although awards were given in other categories. In 1997, it was again awarded and has been ever since. Frank Thomas won the Comeback Player of the Year Award twice. In 1999, a special Player of the Decade award was given to Ken Griffey, Jr..
^ For MLB's listing of awards and winners, go to MLB's awards page. Under "All-time winners," click on the drop-down menu (which lists all of MLB's current and discontinued awards). When you click on each award, you then see all of that award's winners. MLB Advanced Media, LP. Retrieved 2016-11-15. ^ "Major League Baseball Players Association: Programs". Mlb.com. Retrieved 2010-03-18. ^ Miller, Doug (November 9, 2015). "Donaldson, Harper top Players Choice field: Jones is Marvin Miller Man of the Year; Greinke, Keuchel named Outstanding Pitchers". MLB.com. Retrieved 2015-11-11. ^ Graham, Dennis (November 30, 2018). "Curtis Granderson, J.D. Martinez Win Top Honors in 2018 Players Choice Awards". playerstrust.org. Retrieved November 30, 2018. "Players Choice Awards History". MLB.com. Major League Baseball Players Association. Retrieved 2016-10-28. This page was last edited on 1 December 2018, at 00:39 (UTC).